Round Top, Northfield, Massachusetts, U.S.A.
D. L. Moody (1837-1899) was an American evangelist who founded Northfield Seminary for Young Women (1879) in Northfield, Mass. where he was born and died, and Mount Hermon School for Young Men (1881) five miles away on the western side of the Connecticut River in Mount Hermon, Mass. J. Wilbur Chapman, in his book The Life and Work of D.L. 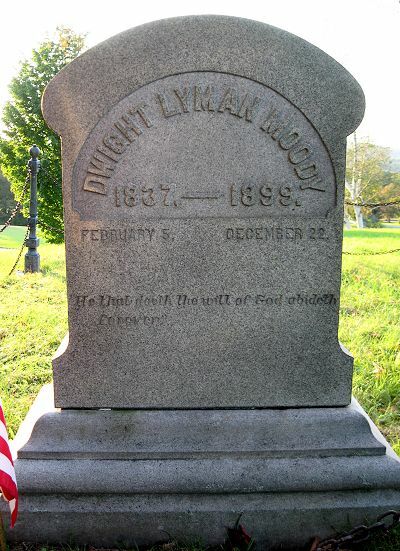 Moody, says, "[Moody] knew that the object of Christianity was to make men and women better in every way, and fit them, not only with all their heart but with all their mind to serve their God and their country, so he founded these institutions for the turning out of such characters." It mattered very much to Mr. Moody what his students learned and believed. The summer before his death, he said, "People have an idea now that it makes very little difference what a man believes if he is only sincere, if he is only honest in his creed. I believe that is one of the greatest lies that ever came out of the pit of Hell." Inscription: He that doeth the will of God abideth forever. 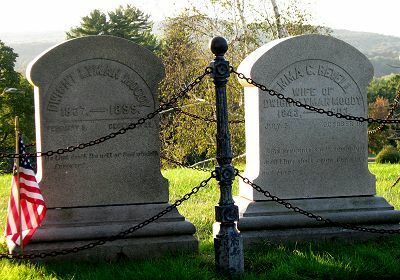 Emma C. Revell, wife of Dwight L. Moody is buried beside him. Inscription: His servants shall serve him: ...and they shall reign for ever and ever. Continue past Northfield Town Hall about 1.5 miles. Turn right on Moody Street. Moody's birthplace, 32 Moody Street, on the left just before the street veers left to Winchester Road. Mr. Moody's mother occupied this home until her death in her ninety-first year (1896). Up the hill behind the house is Round Top and the gravesite where Mr. Moody and his wife, Emma, are buried. Continuing straight on Route 10 N, the Northfield Campus is on the right, as well as the Moody's Northfield residence. The Northfield Bible Conferences (1880-1902) were also held on this campus. Both houses are presently closed to the public. Photographs by Stephen & Dorothy Ross for WholesomeWords.org 2008.